Baking is one aspect of cooking that is becoming popular. The job of producing pastries is becoming quite attractive. That’s why there are many baking and pastry schools being opened. If you want to enter the world of baking and pastries, you have to learn to make the right choices. You need to understand the different options you will encounter. First, it would be good to clarify these terms. What is a baking school? What is a pastry school? Well, baking and pastry schools essentially mean the same thing. In practical use, these two terms can be used interchangeably. Simply put, baking is the process of cooking in dry heat or oven. Pastry, on the other hand, is the result of baking. It should not be difficult making sense of these terms. 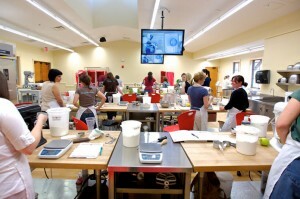 There are three forms of baking and pastry schools. These are the culinary institutes, community colleges or vocational schools, and college or university. Culinary institutes are academies that provide specific training in the culinary arts, offering short hands-on programs. Community colleges, on the other hand, offer programs that are typically less expensive compared to those offered by culinary institutes. In the case of college or university baking and pastry instruction, a well-rounded liberal arts education is involved. This is more suitable for those who want to start their baking businesses since additional courses like business management are included. Baking and pastry programs can be offered as certificate, diploma, associate, or bachelor’s degrees. Certificate programs provide basic training and last from six months to a year. These are what culinary institutes and vocational schools offer. Diploma programs are usually intended to prepare students for work in a restaurant or bakery. Associate’s degree programs are typically offered to students who have restaurant management aspirations. On the other hand, bachelor’s degree programs are the ones given by colleges or universities. These programs are centered on culinary techniques, restaurant management, and hospitality training. In choosing, it is important to evaluate the following: the type of school, the kind of program offered, flexibility of the program, accreditation, and support after graduation. It is important to know the type of school and program to know if they are suitable to your goal. For instance, if you aim to assume a restaurant management position after graduation, an associate’s degree at a vocational college is enough. Program flexibility also matters especially if you need to work or to attend to other needs. Likewise, accreditation factors in. You have to choose an accredited school or program if you want to be more attractive to prospective employers. Lastly, it is important to choose a school that can help you find work opportunities or establish connections to get customers for your business. Choosing pastry and baking schools is not as easy as deciding on a dish to cook. There are many factors that need to be considered. You have to be mindful of outcomes. You also need to take costs and program flexibility into account. You have to consider your goals in deciding to enroll in a baking and pastry school. It is important to keep everything in perspective and to carefully assess choices. Next Entry: What is the Pastry Chef Job Description? Next Entry What is the Pastry Chef Job Description?